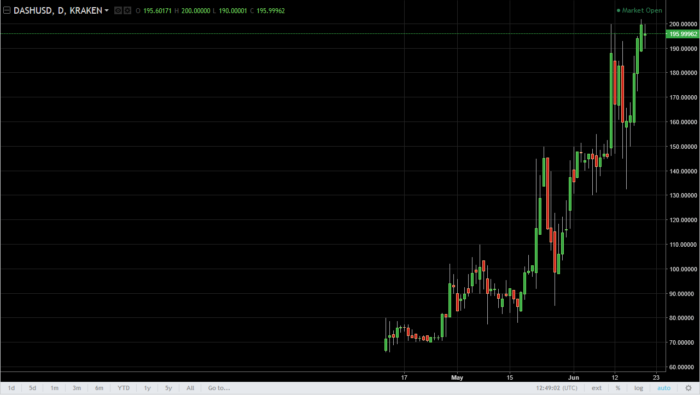 DASH fell slightly on the open for the Tuesday trading session, and then bounced towards the $200 level again. The $200 level continues to offer a significant amount of resistance though, so look to buy on dips as we are not quite ready to break out to the upside yet. LiteCoin struggled a bit during the day, initially breaking above the $48 level, but turning around to form a bit of a negative candle. It looks as if the market needs the pullback to build up momentum, most likely near the $42.50 level. That level should continue to offer buying pressure, just as the $40 level underneath there will as well. Looking for bounces and supportive candle is at lower levels seems to be the best way to play this market. Thanks for watching and we will see again tomorrow.